Potato blight diseases are the bane of gardeners everywhere. 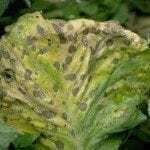 These fungal diseases wreak havoc in vegetable gardens throughout the growing season, causing significant above-ground damage to potato plants and rendering tubers useless. The most common potato blights are named for the part of the season when they’re common — early blight and late blight. Blight control in potatoes is difficult, but armed with some knowledge you can break the disease cycle. Both types of blight are common in American gardens and pose some risk to other closely related plants like tomatoes and eggplants. Symptoms of potato blight are distinct when the timing of their appearance is taken into account, making blight easy to diagnose. Potato early blight is caused by the fungus Alternaria solani and attacks older leaves first. Fungal spores overwinter in plant debris and tubers that were left behind after harvest, but waits to activate until the humidity is high and daytime temperatures first reach 75 F. (24 C.). Alternaria solani penetrates the leaf tissues quickly under these conditions, causing visible infection in two or three days. Lesions start as small, dark, dry flecks that soon spread into dark circular or oval areas. Early blight lesions may have a bull’s eye appearance, with alternating rings of raise and depressed tissues. Sometimes, these ring groupings are surrounded by a green-yellow ring. As these lesions spread, leaves may die but remain attached to the plant. Tubers are covered in spots similar to leaves, but the flesh below the spots is usually brown, dry, leathery or corky when potatoes are cut open. Potato late blight is one of the most serious diseases of potatoes, caused by the fungus Phytophthora infestans, and the disease that single-handedly caused the Irish Potato Famine of the 1840s. Late blight spores germinate at humidity levels above 90 percent and temperatures between 50 and 78 F. (10-26 C,), but grows explosively at the cooler end of the range. This disease is often seen in early fall, toward the end of the growing season. Lesions start out small, but soon expand into large brown to purple-black areas of dead or dying leaf tissue. When humidity is high, a distinctive white cottony sporulation appears on the undersides of leaves and along stems and petioles. Late blight-infested plants may put off an unpleasant odor that smells like decay. Tubers frequently become infected, filling with rot and allowing access to secondary pathogens. Brown to purple skin may be the only visible sign on a tuber of internal disease. When blight is present in your garden, it can be difficult or impossible to kill entirely. However, if you increase the circulation around your plants and carefully water only when needed and only at the base of your plants, you may be able to slow the infection significantly. Pick off any diseased leaves carefully, and provide additional nitrogen and low levels of phosphorus to help potato plants recover. Fungicides can be used if the disease is severe, but azoxystrobin, chlorothalonil, mancozeb and pyraclostrobin may require multiple applications to destroy the fungus completely. Most of these chemicals must be discontinued two weeks before harvest, but pyraclostrobin can safely be used up to three days before harvest begins. Prevent future outbreaks of blight by practicing a two to four year crop rotation, removing volunteer plants that may carry disease and avoiding overhead watering. When you’re ready to dig your tubers, take great care not to injure them in the process. Wounds can allow post-harvest infections to take hold, ruining your stored crop.